Higher education in a crisis phase! Yes, it is so from JNU to Anna University and beyond! JNU as a Central University is its own fashion. It makes news for politicians. Fine, but then it must also be a centre of top academic performance. Is JNU the number one University? No one has asked. As far as academic standards in India are concerned, nobody knows which University is on the top. The IISc, Bangalore is ranked first but then it is mostly seen as a science research centre not a typical academic campus where debates takes place and intellectuals come to make speeches. Delhi University with its campus colleges is fine but then there is too much emphasis on scoring marks for admission has somehow reduced the campus to one of low-key ambitions. In one word, there is no aristocracy of a University lifestyle for students. Now, the higher education as such is itself in a crisis. State universities, taking the South, TN in particular as an example, are marked with high corruption. Three or more VCs; the ex-VCs, are caught up in high corruption. The latest one at Anna University, the newly appointed one is from Karnataka and the Dravidian parties objected to it! VCs must be from one’s own states, the Dravidian parties argue. This is absurd. No minister, the hon’ble Javadekar or his counterpart from Chennai opened their mouths. The controversy might die off. There has to be some light, some explanation or some sort of policy clarification must help. 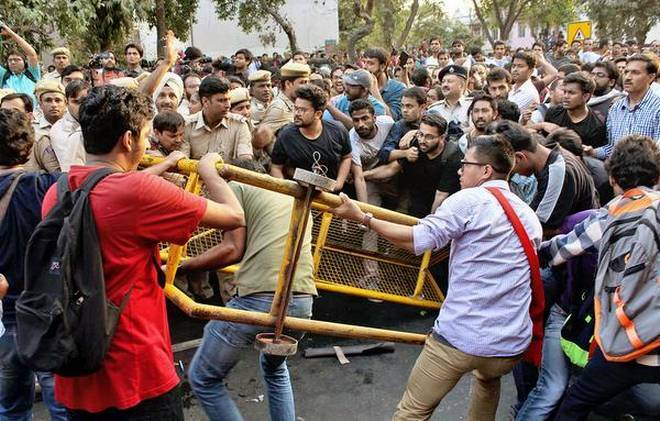 Unfortunately, the Indian higher education is marked by multiple crises. How can you lay down the rule that a VC, the best ones are unlikely from local people, nowadays, the best VCs are somewhere in the US or from some other foreign universities. But who can explain this reality? The higher education ministers are often ordinary mortals! The reasons how huge corruption take place is often with the connivance of the top leadership. In TN this is like daylight! May be elsewhere too! So, first reform in higher education is about preventing corruption. So, what the TN Governor has done is perfectly right. He engaged the Supreme Court judge in the selection. What else he could have done? The second reform is to make universities autonomous in true spirit. The state CMs can be informed, not even consulted. For her again TN is an example how the great Madras University has been now reduced to sheer impotence. No news from the hollowed portals is worth reporting. So, Indian higher education is going to be an uphill task. May be one more high-powered Higher education commission with some reputed international experts could advise the Indian government/State governments about how to go about it. But one thing must be clear. You can’t have reputed universities unless you cast your net for talent internationally. Best talents are as good as nil! Please, politicians, realize! So too, the Indian media, TV channels report local hotheads, including the film actor-turned new style politicians talk less on higher education! So, Indian education and much else, culture and also mother-tongue chauvinism are all turned into heady cocktail and this needs to be realized and conveyed to all concerned. Otherwise, India would be turning out low-performers in all walks of life and we, in India, have to live a very low caliber citizenship.